Smartsheet is a web-based collaboration tool for your project management, team task management, crowdsourcing, sales pipeline tracking needs, and more. It won our Expert’s Choice Award for 2018 as well as our Great User Experience Award for 2018. A leading enterprise collaboration solution for companies, Smartsheet offers businesses an innovative way to collaborate on projects and processes. Accessible from any browser and device, Smartsheet effectively combines the ease of use of a spreadsheet with visual timeline management, collaborative file sharing and discussions, and automated workflow capabilities. Many businesses use spreadsheets for tracking their finances, schedule, and inventories. This makes the familiarity of Smartsheet’s interface easily adaptable to your teams as it still looks and works like a spreadsheet that’s more powerful and customizable. It can manage diverse types of work such as programs, projects, and core business operations. It is also integrated with top web services including Google Apps, Box, and Salesforce. Smartsheet redefines how teams collaborate on projects and tasks such as managing operations, tracking marketing campaigns, and planning events, among others. Its easy-to-use and friendly interface, coupled with Gantt charts, file sharing, and work automation features have helped this tool to quickly become a favorite app for productivity among businesses. The platform is designed to unleash the benefits of collaboration and greater work agility. It speeds up decision-making while understanding the importance of data-driven information. It’s developed to empower teams to execute and complete their projects and tasks with speed and accountability. The cloud-based software is regarded highly for its online project management, file sharing, and collaboration features. This app functions a lot like a spreadsheet, helping users perform a range of tasks that otherwise, takes a lot of time when done manually. Businesses can use the platform by purchasing its cost-effective plans that give value to their investment. Increase your work agility using its simple, user-friendly and intuitive interface. It enables users, without requiring technical resources and experience, to improve their work processes and dynamically adapt to change. This drives your idea from planning to execution in a short period of time. Organizing and structuring workflows are streamlined using rich context for your team and enterprise. It lets you get rid of productivity killers such as information silos, excessive meetings, and back-and-forth emails. Instead, you get to utilize automated reminders, notifications and status reports to ensure your entire team is on the same page. Sharing, collaborating, and connecting with internal and external stakeholders are streamlined to ensure the most up-to-date information is circulated by the right people at the right time. Improve your team’s accountability with transparency on activity logs, detailed history, and shared views to determine which actions are done by who and when. Its collaboration hub is flexible to various business needs. Its aim is to allow its users to focus on their work, not managing their software. Hence, they ensure plans can be easily modified and its dashboard is configurable so you can immediately adapt when there are work changes. Smartsheet allows you to automate actions using simple rules. This means you don’t require hiring IT experts, tackling complex formulas, and working on a single line of code. Automating key processes saves you time and eliminates productivity killers. This includes automating your repetitive tasks, prompting your team to make updates, and getting reminders when tasks and projects are due. It prevents your team from overlooking certain tasks and going beyond the deadline for its completion. It also helps you identify bottlenecks early so you will be prepared to immediately react to these issues and plan on a course of action for your team to innovate. Collecting data is made easy and available on various platforms and devices, whether it’s on your desktop, laptop, tablet or mobile phone. Its form builder enables users to quickly create customizable forms. The Smartsheet Forms ensure data is error-free, consistent, and organized. The data collected is kept in the platform in a structured format for easy viewing. This lets you analyze the information and turn them into actionable insights. Since it allows enterprise applications, you can use your existing applications by syncing data across your organization with a single source of truth. Consistency is crucial for work execution; hence, Smartsheet provides tools to ensure it is met. Using a standard set of components, your team can create and prepare new projects and operations properly and immediately. Right before the kickoff of a new project, you can implement approval workflows to ensure your organization is prioritizing crucial work first. It also lets you incorporate best practices in every task with risk management, reporting, and execution. You can perform robust portfolio analysis by connecting Smartsheet Control Center’s datamart with third-party BI tools. Smartsheet Sights administers KPIs for new projects to update any ongoing work in real-time without conducting additional status meetings and putting extra work for your team. Testing and iterating are regularly done across your organization or department. This lets you stay on top of dynamic work changes so you can react to them quickly. Get your hands with real-time information using Smartsheet Sights and live reports. This allows business leaders and teams to make educated business decisions promptly. It has configurable reports and widget-driven dashboards that can be highlighted without technical support. Since information is available in real time, you can identify and respond to trends immediately. It also lets you shift your priorities as needed when conditions change. Smartsheet unifies cross-functional priorities using connectors and live reports. For instance, it centralizes the different business systems of Engineering, IT, Finance, Sales, HR, and Service Delivery departments. It also lets you protect your information while providing status updates and assigning tasks to your clients and vendors in real time. You can use notifications, Smartsheet Sights, and update requests for these actions. The native app integrations, free and open collaboration, and mobile applications of the software allows you to create teams without limitations. Whether your team consists of 100 to 100,000 members, you are assured that the platform is secure to innovate at. It enables security, user management, and single sign-on capabilities for a more powerful team and project management with scalable administrative controls. Administrators and end-users are given granular sharing permissions to help them stay in control and protect their information. Meanwhile, admins are allowed to handle internal standards, restrict integrations, and approve external domains. You also access account-specific reports to view how users access, circulate and publish information across the platform. Data security and privacy provide you with peace of mind due to the rigorous infrastructures and admin procedures. The combination of around-the-clock monitoring, data encryption, user authentication and physical security ensures top-notch protection. Smartsheet acknowledges that no single platform caters to every single need of a business. That is why it allows popular and useful enterprise tools and apps to integrate with their system seamlessly as they aim to provide you with solutions for your business processes. Integrations are available to address mission-critical data by utilizing off-the-shelf integrations and partner-built solutions. Its out-of-the-box integrations include Google G-Suite, Box, DocuSign, and Microsoft Office 365, among others. This collaboration encourages efficiency and productivity without having to switch from one app to another. It also has connectors such as Salesforce, Jira, and ServiceNow that automatically syncs your data with real-time information update. You can also build your own integration using Smartsheet’s open API. What Problems Will Smartsheet Solve? Solution: Smartsheet ensures customer onboarding projects are delivered on time and within the budget. It does so by prioritizing a transparent onboarding project approval by connecting with Salesforce, automating service demand management, and setting up a project approval workflow. The system also adapts to meet your customer requirements and improve data visibility. Solution: Smartsheet collects consistent data, automates approval processes, and transforms data into action. By automating your business’ key processes, you can save time on doing tasks again and again. Since it doesn’t require coding, any user can create, modify, and maintain these prompts quickly and effectively. It provides solutions to spot and eliminate bottlenecks that drag down cycle time. Solution: Smartsheet drives performance by optimizing campaign execution, accountability, and results. It develops a framework for the execution of marketing initiatives. It also has campaign calendar to keep you stay on top of your schedule – whether that’s highlighting milestones or tracking of launch dates. The app ensures your team gets access to context-driven data and a unified campaign collaboration plan. Since each company has specific business requirements, it is sensible for them to abstain from searching for a one-size-fits-all faultless software solution. Needless to say, it would be useless to try to find such a system even among market-leading software solutions. The smart thing to do would be to list the various vital factors that require consideration such as required features, budget, skill levels of staff members, company size etc. Then, you should do your homework thoroughly. Read some Smartsheet reviews and check out each of the other apps in your shortlist in detail. Such in-depth homework can make sure you reject ill-fitting systems and zero in on the system that presents all the elements you need for business success. 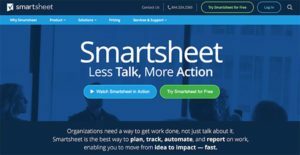 How Much Does Smartsheet Cost? We realize that when you make a decision to buy Project Management Software it’s important not only to see how experts evaluate it in their reviews, but also to find out if the real people and companies that buy it are actually satisfied with the product. That’s why we’ve created our behavior-based Customer Satisfaction Algorithm™ that gathers customer reviews, comments and Smartsheet reviews across a wide range of social media sites. The data is then presented in an easy to digest form showing how many people had positive and negative experience with Smartsheet. With that information at hand you should be equipped to make an informed buying decision that you won’t regret. What are Smartsheet pricing details? What integrations are available for Smartsheet? Pros: This tool allows me to create project plans and to share all of them with other members of the team, I can upload project plan in SmartSheet like I do in an Excel and this makes very easy to share the projects with others. There are lot of helpful features such as alert, updates, attachment and discussion that are great when interacting with others who work on the projects. Also, it allows us to keep track of other team’s progress. Cons: This is great project management solution, I haven’t found something to dislike about it. Pros: Smartsheet is easy to set up and easy to share, it has built-in calendar and Grantt views. It works great with Zapier and the API is clear and user-friendly. I’m using it in combination with Wufoo and I have to say that this saves me lot of time. This tool provides me with overview of the projects I’m working on. Cons: The process of setting up notifications can be little clunky. Also, when I want to create equations it can be really complicated. Sometimes I use other product for task reminder/assigner because it tracks better than Smartsheet. If you need more information about Smartsheet or you simply have a question let us know what you need and we’ll forward your request directly to the vendor.